I moved to Colorado back in 2004 and as soon as I got there, I fell in love with mountain biking. I started doing some research and wanted to know what the very best mountain bike was (hardtail). The answers I kept finding all pointed toward the same thing: The Schwinn Homegrown. Well, I looked and looked and looked. There were difficult to find, as people generally held onto them. Finally, I found a local Homegrown for sale, a beautiful 1998 Homegrown XT in bassboat orange. Completely original and stock, in great condition. I bought it for $550 on the spot. As I got to know the bike better, I got better acquainted with the bike's capabilities and the limitations of the components on it. In college I road that bike everywhere, and in all weather. It was my only bike, so I rode it on the streets, on the trails, everywhere. Lots of fond memories. Around 2010, my wife and I moved to the east side of town, away from the mountains. I had no idea what a hit my mountain biking passion would take as I was surrounded by flatland everywhere. At this point, the bike was tastefully upgraded, yet in a weak moment I sold it, I'm pretty sure for the same price I bought it for. However, the Homegrown bug had bit, and we all know there is no cure! Due to a bicycling program I did through my work with kids, we ended up with a lot of parts and bikes. When that program ended, we had lots of stuff left over. Mountain bike-less, I decided to head over to one of the local co-ops to donate the boxes of leftover stuff and parts we weren't going to use anymore. I can remember it clear as day - I brought the box out of the car and walked it down to the shop, which was basically a garage in an industrial part of town near the railroad tracks. I asked if they could use the parts and where to put them, they said sure and had me put it out back in the the scrap yard. Now, imagine a decent sized backyard - completely stacked with old bikes, frames, parts, wheels, etc. All out in the open, behind chained link fencing. If you've never been to the backyard of a co-op, you should experience it at some point. Bikes everywhere, and total sensory overload for any bike nerd! I always enjoyed going back to look at all the bike stuff and soak it all in. Well, perusing around, something caught my eye. A bare frame. Raw aluminum. There were plenty of old frames, steel, aluminum, etc. But something was different about this one. And then I saw it - the epicenter seat stay. I had been without a Homegrown for several years, but every Homegrown owner knows that wishbone design. I looked a little closer, and was dumbfounded when I realized the frame was unused! It had never been built up. I wondered why, and kept looking for a reason. Then I saw that the drive side rear dropout was bent in towards the axle opening. The head tube also had a scuff on the facing. It was obvious the frame had been dropped and suffered damage. Hmmm...maybe it was fixable. The frame was basically in a scrap heap. Maybe it wasn't ready to die. The Homegrown empathy took over. I went back in and asked about the frame. They said I could have it. I decided to fix it. Realizing that aluminum tends to only bend once, I wasn't going to bend the dropout back into shape. I carefully filed the axle slot open to match the NDS axle slot. I picked up a derailleur hanger from Wheels Mfg and used it as sort of a 'mold' to use epoxy to fill the void. It's held up fine. The beautiful thing is that the repair is encapsulated by the hangar and the axle nut doesn't really contact it, so it doesn't really receive any pressure. The donor bike came with an XTR M951 crankset, but the BB was really crunchy, the large ring pretty worn, and I've read enough bad things about octalink that I think I'm going to stay with the Deore. Plus, I like the crank and I'm a square taper kinda guy. 2. The rear hub has some 'crunchyness' to it. I rebuilt it and it didn't seem to help. Examining the cones, there was at least one that had the start of some pitting/galling. It will be a fun challenge to see if I can locate some bearing cones for this or a suitable replacement. Not ready to give up on the wheelset yet. 3. The SID fork. So, the fork is losing air and under my weight (155lbs), compresses to the end of it's travel. I'm trying to determine if I should replace the fork. I've had a hard time figuring out if the fork is rebuildable. I've read that the cartridge on these forks basically dies and there are no replacements. If anyone has some additional wisdom about this, I'm looking for all the info/knowledge I can get. I wouldn't mind a little bit of extra travel, so a new SID or something similar (XC race fork) could be a good option. 4. I need to pick up a new chainring. I'm going to run with a 1x8 system for a while. I like the simplicity of 1x drivetrains and the ring on there is toast. I have a new HG chain ready to go once I get the chainring. 5. Pedals - I like flats, and I've got a pair of older Suntour XC-2 (beartrap) pedals I really like that will probably go on this bike. Feel free to follow along as I document the build and repairs! Thanks again for this awesome forum. Excited to get back into mtb. Ordered a new 34T narrow wide chainring. Once I get that, will throw on a new chain and the bike will be ridable. On Friday, I got the sheared bolt out of the left side brake lever clamp and also rebuilt the 8 speed shifter. Will have some pictures soon. Good times! So, a free frame and were able to get the XTR parts and a SID for the build from a $20 thrift store bike? You hit the Lottery with that one!! Looks like a 21" frame. If you decide to get a different fork I would be interested in buying that one off you. All my spare forks have the steer tubes cut too short to use on your frame so I can't help you there. I don't know if/how to rebuild the SID, but i think I could use those good looking lower legs on another fork of mine. You are correct on using a chainring bolt on the XTR bar clamp. I had to do that in the past myself. 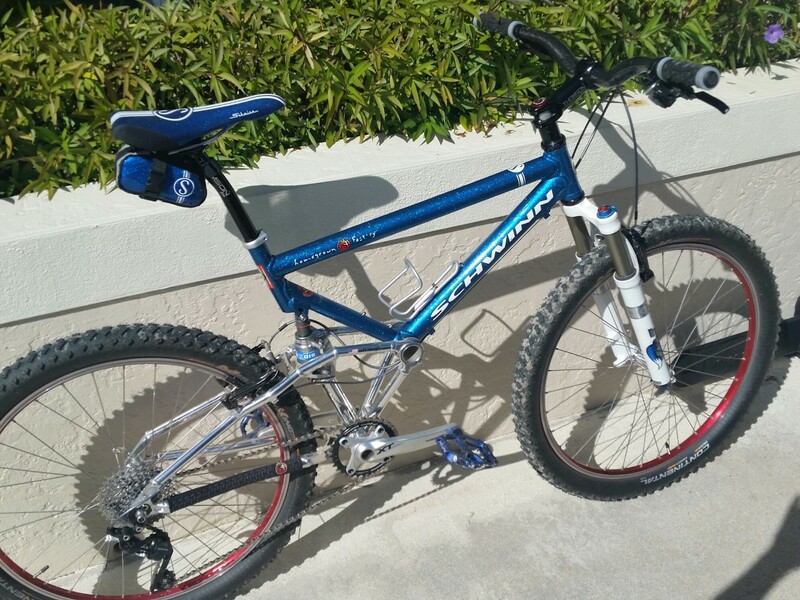 1997 Homegrown Factory XTR Hardtail 17"
1998 Homegrown XT Hardtail 17"
1999 Homegrown Pro Hardatail Gravel Conversion 19"
Yep, $20. Well, and then there was the derailleur hanger, which I recall was about $18 or so. Should receive the new chainring in another day or two and then will get this bike under power. Next order of business will be taking a look at the SID and seeing if it is salvagable. I don't know excactly what seals I will need for it. I'm putting the idea of a toasted damper out of my mind for now, although it would be good to experimant and figure out if any more available parts from other suspension forks would work in the SID to bring it back to life. We'll cross that bridge soon enough! Also bikeric, thanks for your offer on the SID. I'm going to see if it can be fixed, and will go from there. BTW nice Homegrown collection! Well, today was a fail. Got the narrow/wide chainring and the new chain and quickly found out that the chainring was designed to go where the large ring on a triple crankset. On this particular crankset (Deore M480), the diameter where the largest chainring mounts is different from where the middle chainring mounts, so it actually wouldn't fit in the middle position. So I threw it on the outer position just to see what happened. Wow...it was incredibly sensitive to chainline issues! It wanted to easily throw the chain off. But that was partially because of the chain. It is an HG50 and NOT a good match for older XTR. I put back on the old middle ring and even with that, the new chain was terrible. Chainline put it somewhere around the 3rd smallest cog on the cassette, which was super weird to me. I had an IG-90 chain on another bike that I pulled off and tried on the bike and it was much better, so the new chain was causing a lot of issues. I'm going to have to sit and think about this 1x8 chainline issue a little more. A little surprising was how wobbly the XTR RD was, but maybe not surprising based on how old it is. There was a lot of play, which I think was affecting the shift quality. New challenges to be solved! I had full XTR M950 groups on most of my bikes for 20 years. I finally made the switch to newer 10 and 11 speed SLX and XT and I couldn’t be happier. That old XTR was great in its day, but today’s stuff is really just as good IMO. I’m not buying XTR anymore because the price is outrageous. A couple days ago I rode in the mountains on a 1x11 SLX setup and it shifted perfectly. Never dropped a chain either. I understand the desire to keep these Homegrowns period correct, but if you’re actually going to ride them I see no problem putting modern components on them. Most NW 1 speed chainrings are made for skinnier 9/10 speed chains anyway. The 8 speed chain will move side to side on the teeth causing early wear. I hear ya. I wouldn't mind switching to a 1x10, but I figure, I've got the 8 speed cassette and shifter...let's try to make it work. I've ordered a 9 speed chain to use with the N/W chainring, and I think I'm going to get some longer chainring bolts and spacers and get the chainline worked out. Also, I think there was something really funky about that HG-50 chain I was using. The links were not straight, even when the chain was pulled straight. They were at an angle, and I've not seen a chain do that before. It was new. I went with a KMC X9 and we'll see how it works! More updates to come later in the week! My latest bike was built as a 1 X 10 using modern XT componentsand a Fox Fork. For brakes I used Avid Ultimate rim. Love the way it rides and I like no having a front derailleur. I am starting to think having an old frame with modern components is pretty cool. Have a 9 speed chain on the way. Next will be to take some measurements and find the right chainline to then order some spacers and chainring bolts.